getting the edges “right” took about 10 hours but it worked! thanks to Margaret Johnson for giving me these “proper” needles and introducing me to this magic thread ! 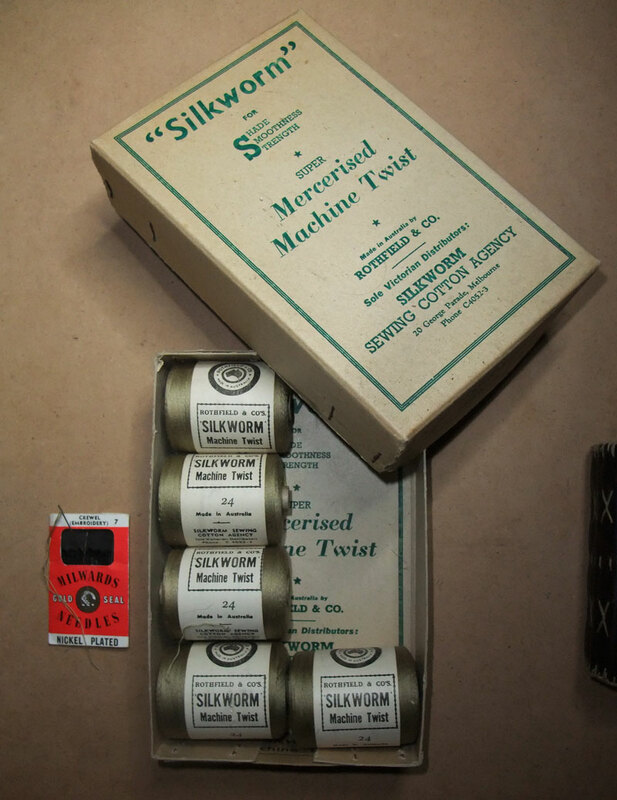 Margaret Johnson sent me a reel of the Silkworm Machine Twist thread back in 2012, I fell in love with it whilst working on the Hopeful Lunacy scarf and then again for the netted & knotted fringe on the Memory Keeper Bag. Found a box for sale online in a country town haberdashery in Victoria (not far from Margaret’s place) & just this morning unearthed a mention of the company in the business section of a newspaper from 1948 when they merged with Rothfield & Co. 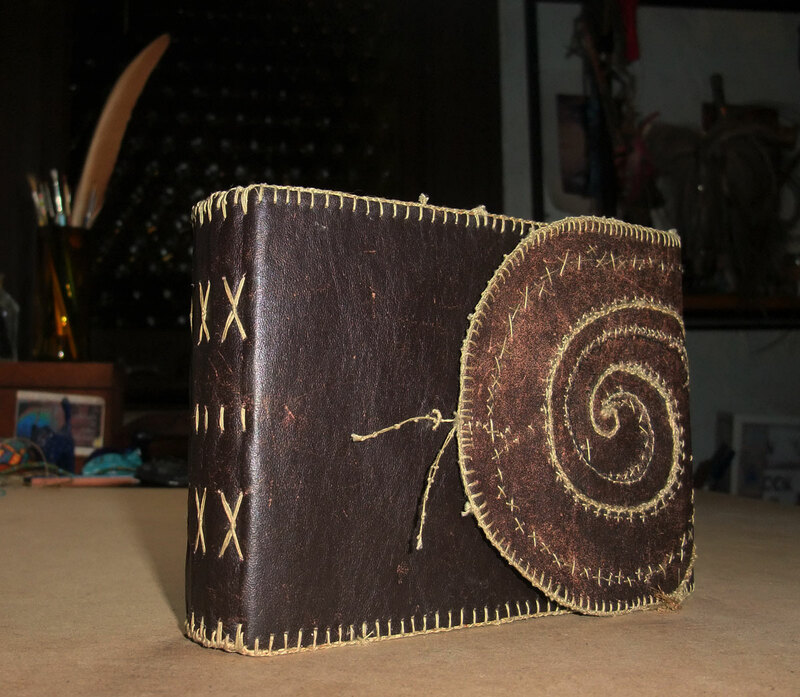 So I would say this thread would be at least 60 years old, it is strong, has a beautiful hand and waxes perfectly for bookbinding. Richard is an artist and teacher with the best eyes but gave up both after teaching at an expensive private girls high school where the parents expected their daughters to graduate regardless of talent… they paid for results after all… but the artistic soul can’t be quelled, he takes the best photographs and we visit art exhibitions most weekends. He should write an art column for the newspaper as he is the most knowledgeable man I know. He was my second set of eyes all the way through the drawings for An illuminated Book of Cats and gently lets me know when I should put the crow drawings away! i love this look and the thread is perfect on the leather giving it that aged look. Thanks Deanna, I am in love with that thread and the leather is so soft! thanks for the good words Grace, must say I am pleased with this one! Wow! 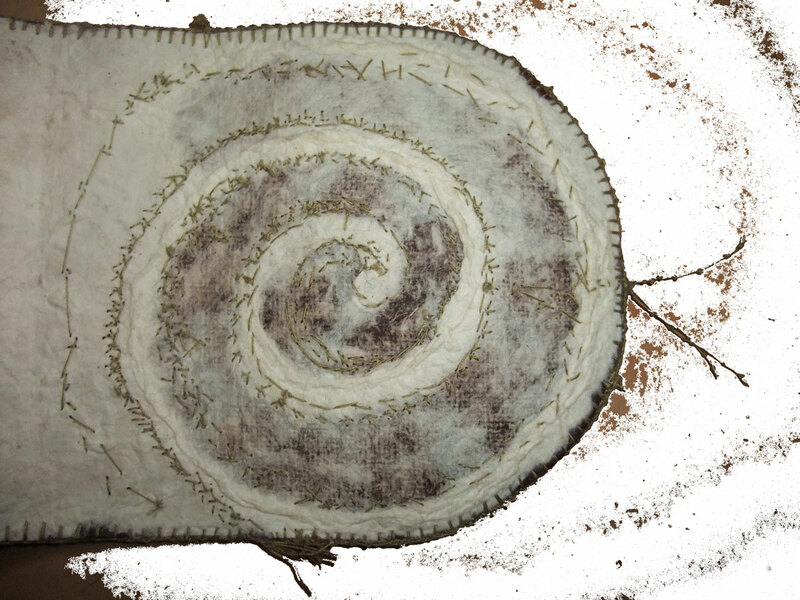 I love the dark leathery outside spiral and the soft, pale stitchy inside spirals equally. They are like the dark and light side of the moon. Richard is a lucky guy. Ah I’m the lucky one, this is pay back for the hand carved bone moon on the 4 strand plaited flax cord with the hand carved bone toggle that he gave me last year! Thanks Marg, you are one of those special friends who has given me some of the fabulous treasures in our house Your Crow Woman and Blue Star Woman look after everything that comes out of this place! & Hey! 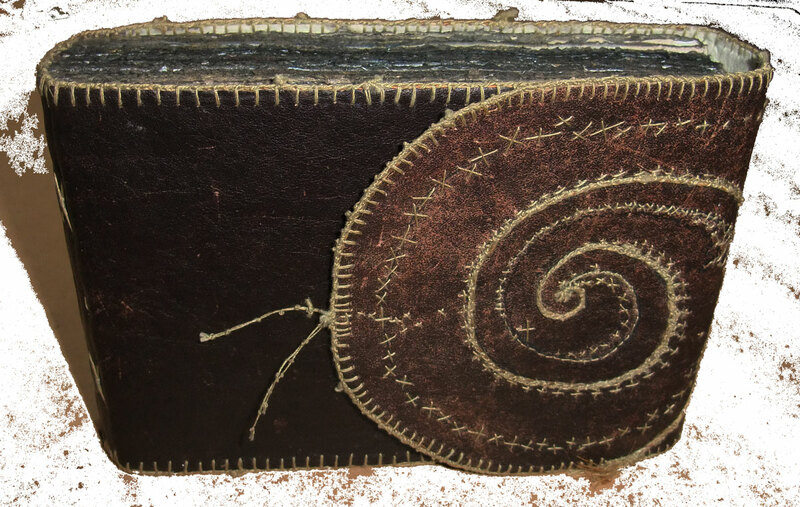 I’ll send this in an e-mail too one of the NSW Guild of Bookbinders members Karen Vidler is holding an open studio day at her Book Conservation Services Friday March 7th & Saturday March 8th from 10am to 4 pm Room 48/ 1 Halford St Castlemaine, Victoria that’s not too far from your place? Simply stunning, Mo, and a real treasure. 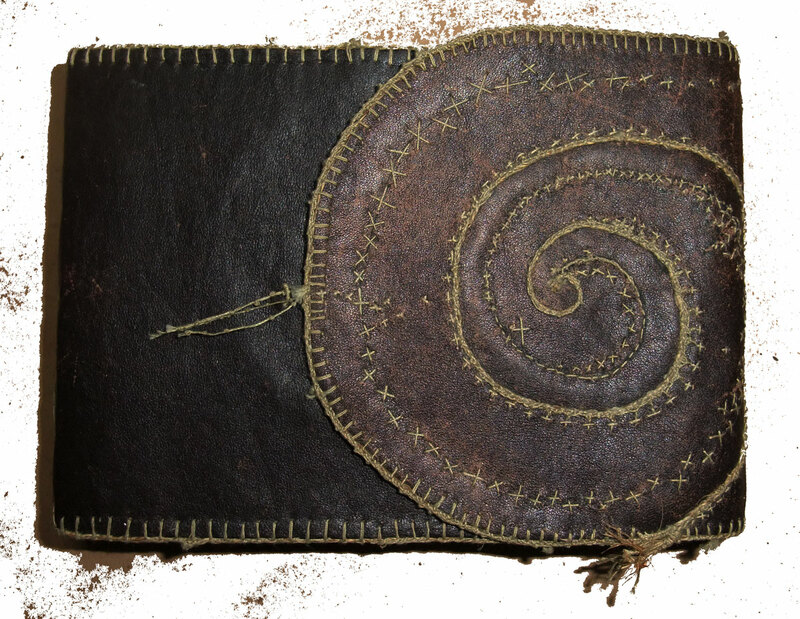 Your spiral stitching is just beautiful and I love the dark edges. Rod’s book sound like a winner too, and I hope you take a photo of your rose stem arrangement! I’d forgotten that Morticia did that! each book informs the next so crow book 3 will have stitched details black on black this time as it is a crow book after all! Richard is such a special friend! thanks Cindy you truly know about just going round and round with your beautiful word quilt last year! cats make such fine lines! I just love this piece! The textures, the shapes, everything! Agree with others that it makes for a spectacular gift. 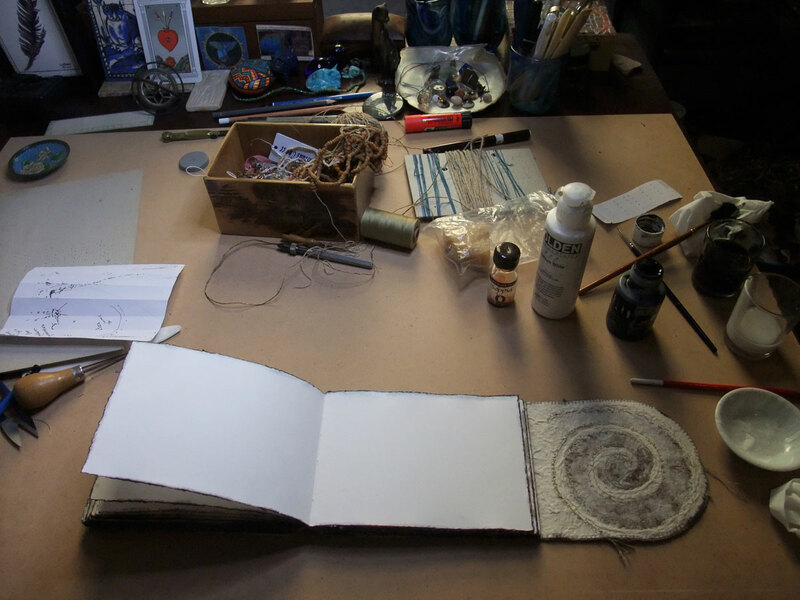 The spiral gives me ‘snail’ and also ‘cosmos’ – fitting, I think, for an artist of your vision! thanks Dee! am not feeling very visionary today, having the devil’s own time coming up with the right design for the Crow Book 3 for Old Man Crow! 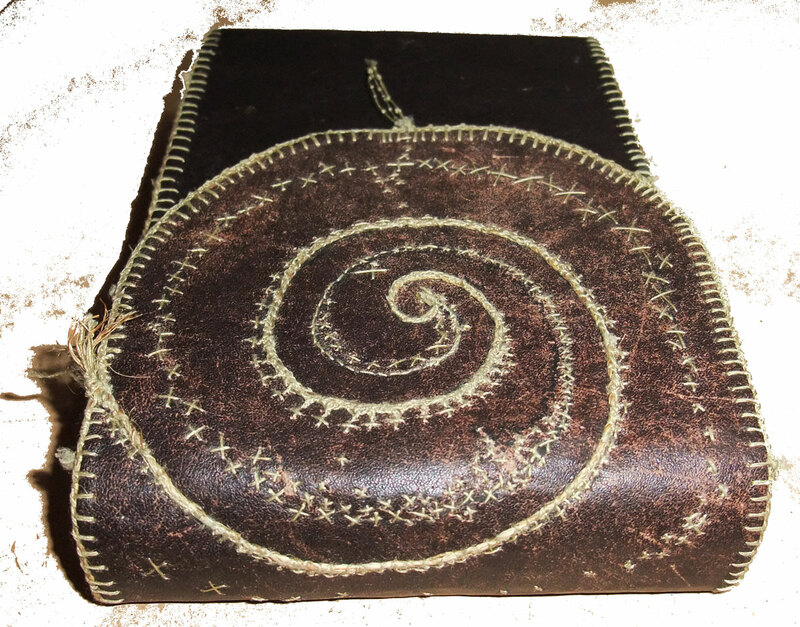 hey mo crow like your snail book, found the link from spirit cloth btw. thanks for popping in Anna! Very very cool and it looks like so much work- you continue to amaze me! well you know how it is Sharmon, once you get an idea you just keep going with it ’til it’s done! This is beautiful, Mo. Really, what a special gift. Thanks Susan, he loves it! beautiful work Mo, what a very special gift, a treasure of you for sure! 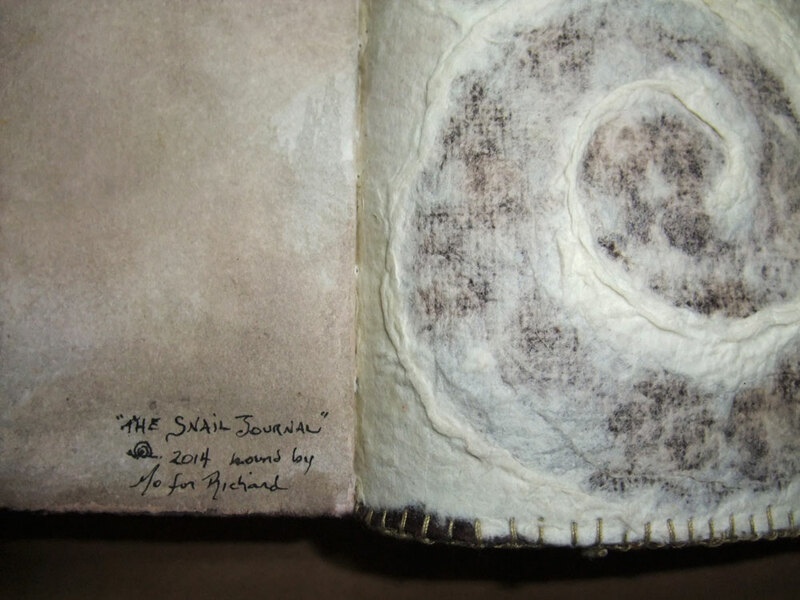 Mo, I found this post of your snail journal, and then, by serendipity ( through the thread! :-)) was led to your illuminated book of cats while on a ‘whim’ looking back through Jude’s February archives. I just love what you did with that book. The energy you put into the tail of the cats, which feels so sensitive to the power/energy of a cat–and the verse, and the gorgeous illustrations. All of it. My mother’s birthday is in February, and she is a longtime ‘doorperson’ to cats. I am going to send her the link. Think she will love it. She’s also into cloth and stitching, as I am. I used to do “illuminations” in my twenties, before I ever knew what they were really, so I am drawn to the concept. Cats are very dear to me. You began with an Abyssinian. I was honoured to care for one when my son was a baby, her name was Gabriel. Like the angel. My life is filled with cat-ness. Just wanted to tell you how great it is to have stumbled on your lovely book! I write poems, among other things. I’d like to have your permission to use one of the verses in that book as an epigram to a poem. Of course I would attribute it. To your partner? Not sure which one! They are all good. November is National Poetry writing month for some, as is April. Some call november “National Novel-writing month”, but for me, it’s poems. A poem a day. thank you for the kind words Alison, Rod Morgan is the writer Ariel P Cat is the muse and please send a link for us to OK? this is amazing work..so beautifully made. I loved working with that cat scratched old leather! Reg Mombassa Shine NYE 2013 banner!